Refer to the testings posted at the gym in the front window. AmKor Collegeville runs testing every 3 months on Saturdays. Students will be informed by the instructor when they are ready to test. A list of all students to test will be posted outside of class approximately two weeks before testing. Please inform Master Matys if you will not be able to attend testing. Make-up testings are available and are held the month after the standard testings. For more information is provided to the right to help the student know what is required for each Gup testing. Our requirements are set by the AmKor Karate Institues headed by Master Frederick Scott, 8th Dan, Chief Instructor of the Amkor Karate Institutes. General testing is held 4 times per year for under Black Belt ranks. 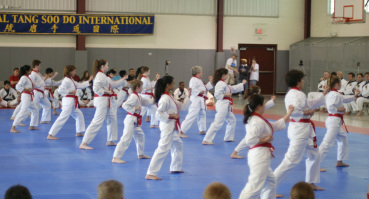 Testing is required for advancement to higher belt ranks, but is not mandatory to continue training. Students may elect not to test from time to time. Higher rank at our schools is viewed as taking on more responsibility. It should also be stated that students do not automatically become eligible for promotion simply by fulfilling physical or time in grade requirements. Standards at our schools are high, with character and personality development, along with physical skills, figured into promotion eligibility. The Martial Arts we teach at our schools was learned from the highest authorities on our style of Karate in the world and is not watered down by faulty transmission of the knowledge or commercialism. For over 36 years, we have given our students what they earn regarding promotion, and what they expect and pay for, a quality Martial Arts education.